Complete both Michelson interferometer and Fabry-Perot interferometer experiments with this high-grade equipment set. 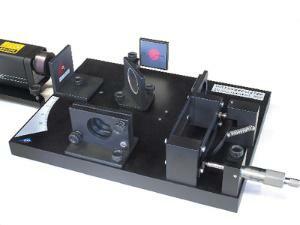 This complete equipment set of optical components is mounted on a heavy, rigid base plate for precise and reproducible measurements. The large optical components permit a generation of clear and well-defined interference patterns in daylight. The reflective observation screen also features an adjustable inclination. Pre-defined component positions allow for quick rearrangement to ensure extremely rapid preparation for the various experiments. The equipment set includes a stable plastic box for storing the interferometer and the laser base plate. The beam splitter has an evenness of λ/10 (front side), λ/4 (rear side) and measures 40 mm dia. Surface-coated mirror has an evenness of λ/2 and is 40 x 40 mm. The eccentric reduction is approx. 1:1000 (individual calibration specified on eccentric base) and is 2.5 x 24.5 x 33 cm. It weighs 10 lb. A vacuum hand pump and silicone tube are required. Accessories information: A He-Ne Laser and the Accessory Kit, both available separately, are required to complete some of the experiments. This accessory set for the interferometer consists of a vacuum cell for determining the refractive index of air and a glass plate on a rotatable holder for examining the surface quality of optical components or Twyman-Green interferometer.